Inside Diameter: 1.3", 1.4", 1.5", 1.6", 1.7", 1.73", 1.8", 1.9", 2.0", 2.04", 2.12", 2.2", 2.3", 2.4", 2.44", 2.5", 2.6", 2.7", 2.75", 2.8", 2.95", 3.14"
Outside Diameter: 1.73", 1.81", 1.9", 1.97", 2.04", 2.12", 2.2", 2.3", 2.4", 2.44", 2.52", 2.6", 2.7", 2.76", 2.83", 2.91", 3", 3.07", 3.15", 3.23", 3.35", 3.54"
Case Size: 1' 7" x 1' 4" x 4.1"
This Professional pull and press sleeve kit set with 5 pulling spindles is perfect for removal and installation of bushes, bearings and seals. 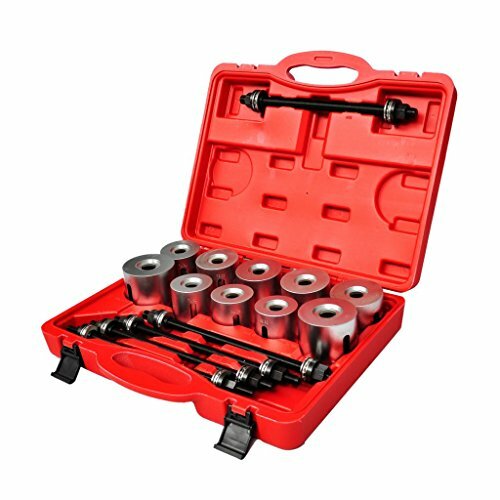 This professional pull and press sleeve kit set with 5 pulling spindles and nuts is designed for the removal and installation of bushes, bearings and seals. The entire tool set is with fully universal application for cars, LGV or HGV. All is suited to silent bearings, hydraulic bearings, bearing bushes, ball bearings, shaft seals, rubber bearings, etc. This tool kit set comes compelete with 22 Press Sleeves and 5 x Pulling spindles and nuts, 27 pieces in total: - 22 Press Sleeves: - Inside Diameter: 1.3", 1.4", 1.5", 1.6", 1.7", 1.73", 1.8", 1.9", 2. ", 2.4", 2.12", 2.2", 2.3", 2.4", 2.44", 2.5", 2.6", 2.7", 2.75", 2.8", 2.95", 3.14" - Outside Diameter: 1.73", 1.81", 1.9", 1.97", 2.4", 2.12", 2.2", 2.3", 2.4", 2.44", 2.52", 2.6", 2.7", 2.76", 2.83", 2.91", 3", 3.7", 3.15", 3.23", 3.35", 3.54"
5 x Pulling spindles and nuts: M1, M12, M14, M16, M18.